The first step in the career development process is to understand what employers need and look for in engineers. This knowledge will be useful when building a resume, networking with employers, and preparing for interviews. Much of the employment process involves convincing the hiring manager(s) that you have the skills, interests and personality traits that best match the needs of a position. Employers typically list the required and preferred qualifications in their job postings, so it is important to analyze these descriptions when applying for specific positions. However, there are certain qualities that are important to many employers and these are the focus of this section. Is the candidate a person of good character? Does the individual have the qualifications needed to do the job or can they be trained in a reasonable amount of time? Is the individual a good fit for the position and the company culture so the team will be happy and productive? Is the individual likely to be a long-term employee? Each of the above abilities requires the application of a certain mix of knowledge, understanding, behaviors and skills. The College of Engineering worked with a large group of employers to identify the key competencies that are required in the practice of engineering, which align with the ABET student outcomes. These are shown in the graphic below. The specific knowledge, behaviors and skills that a particular employer is seeking can be found by carefully reading their job descriptions. The engineering curriculum at Iowa State University was developed, and is continuously being improved, to ensure students achieve the competencies that employers want to see in graduates. Be sure to take advantage of the opportunities to develop your engineering competencies and professional skills through coursework, co-ops/internships, student organization projects and other activities. Feedback from employers indicate that they are generally very happy with the skills of entry-level engineers and when there are problems it is usually due to issues such as lack of motivation or poor attitude rather than a lack of skills. Since many candidates have similar qualifications, fit for the position factors heavily into hiring decisions. The following three fit factors are often formally or informally considered. Candidates that show matching interests will have an advantage over other job seekers. Job/Work Fit – Employers look for individuals who have a strong interest or passion for the type of work that needs to be done. These individuals will put more effort into their work, take more pride in their work, enjoy their jobs more, and are likely to stay in their positions longer. Organization Fit – Employers also want to ensure a good fit with the team and company culture. When the fit is good, teamwork is more effective, people enjoy being at work more, and employee turnover is lower. Location Fit – The geographic location and community preferences of candidates are also often given consideration. Employers want to hire individuals who will be happy living in the vicinity of the work location. This is a consideration even when filling internship positions since many employers are hoping to convert some of their interns to full-time employees. Employers located in rural areas and smaller communities often have smaller applicant pools and are eager to hear from candidates with a preference for small town living. Alternatively, employers in large cities or in faraway places may have concerns about candidates who are unsure about city living or being far away from home. Employers are usually looking to hire individuals who have the potential to become long-term employees. Hiring and training a new employee is costly and has a negative impact on productivity, so employers prefer not to go through the process any more than necessary. Candidates who are potential long-term employees, often have ties to the area (e.g. family or friends nearby or grew up in a similar community) and have career goals that align with the organization’s needs. Emphasizing these connections can give a candidate an advantage over other similarly-qualified candidates. Since many students and graduates complete similar coursework, employers largely differentiate job candidates based on their grade point average (GPA), the amount and quality of their skill-building experiences outside the classroom, and the ‘fit factors’ mentioned above. Good grades are important and indicate that you have the ability to learn, have high quality standards, and have mastered certain skills. There is a fairly strong linear correlation between (GPA) and employment at graduation. Many entry-level jobs require applicants to have at least a 3.0 GPA, and job opportunities decline about 10% for every tenth of a point GPA falls below 3.0. Some employers also use GPA as a way to limit the size of their applicant pools or quickly filter out a portion of candidates when reviewing applications. Additionally, your GPA at graduation will likely affect your starting salary, so there is good incentive to do your best in your courses. A good GPA alone is not sufficient; “straight-A” students have difficulty securing employment when this is all they have to put on their resumes. In addition to good grades, employers want to see work experiences during which transferable skills were developed. All work experiences are valuable and can be used on your resume to highlight skills, but employers especially value professional engineering work experiences, such as co-ops and internships. Co-ops and internships are professional positions where the employer has agreed to make it a learning experience and help you develop workplace skills as you complete engineering tasks. Participation in student clubs or volunteer organizations provides additional skill-building opportunities that many work experiences don’t offer. It’s not enough to simply belong to an organization; you need to contribute. Employers want to see that you have practiced your teamwork, leadership, communication, project management and other skills by actively contributing. Holding an official leadership position looks very good on a resume but leading any team effort indicates leadership potential and is helpful. 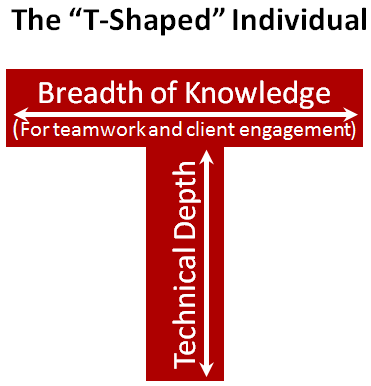 Employers like “well-rounded” or “T-shaped” individuals. These individuals have technical depth in their area of study, but also have a wide range of interests. They are generally inquisitive and enjoy learning. Since engineers often contribute to multidisciplinary team efforts, it is important that they know a little about other disciplines. Attend presentations and interact with other students outside of your major when the subject interests you.